Nonvolatile semiconductor memory (NVSM) is one of the most important discoveries in the field of electron devices since the invention of the transistor. Invented by D. Kahng and S.M. Sze in 1967, NVSM, today, is the largest electronic industry in the world. This single invention has subsequently given rise to a large family of memory devices including flash memory and electrically erasable programmable read-only memory (EEPROM). All modern electronic devices, like mobile phones, notebook computers, digital cameras, MP3 music players, personal digital assistants, digital televisions, automotive engine control units, portable medical diagnostic systems, USB flash personal discs, and global positioning systems, are all based on NVSM. In the past 20 years, NVSMs minimum feature length has been scaled down from 0.8 ?m to sub-20 nma 40-fold reduction. Many alternative NVSM technologies are being developed to reduce the size (sub-10 nm) and improve device performance. Nonvolatile Memories is a two-volume book containing 32 state-of-the-art chapters written by 71 world-leading experts on nonvolatile memories. It includes comprehensive coverage of the physics, material science, device engineering, and applications of nonvolatile memory devices. 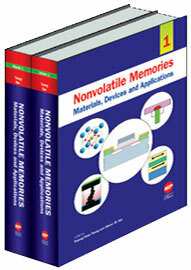 The book summarizes the most recent advances and future trends in the field of nonvolatile semiconductor memory. This book is intended as a reference book for engineers and scientists actively involved in semiconductor device research and development. It also serves as a textbook for senior undergraduate and graduate students in applied physics, materials science and engineering, electrical and electronics engineering, who have already acquired a basic understanding of semiconductor device physics. The 2-volume book is intended as a reference book for engineers and scientists actively involved in semiconductor device research and development. It also serves as a textbook for senior undergraduate and graduate students in applied physics, semiconductor physics, materials science and engineering, electrical and electronics engineering, device engineering who have already acquired a basic understanding of semiconductor device physics.